In a Los Angeles neighborhood plagued by guns, gangs, and drugs, there is an exceptional classroom known as Room 56. The fifth graders inside are first-generation immigrants who live in poverty and speak English as a second language. They also play Vivaldi, perform Shakespeare, score in the top 1 percent on standardized tests, and go on to attend Ivy League universities. Rafe Esquith is the teacher responsible for these accomplishments. From the man whom The New York Times calls "a genius and a saint" comes a revelatory program for educating today's youth. In Teach Like Your Hair's on Fire!, Rafe Esquith reveals the techniques that have made him one of the most acclaimed educators of our time. The two mottoes in Esquith's classroom are "Be Nice, Work Hard" and "There Are No Shortcuts." His students voluntarily come to school at 6:30 in the morning and work until 5:00 in the afternoon. They learn to handle money responsibly, tackle algebra, and travel the country to study history. They pair Hamlet with rock and roll, and read the American classics. Teach Like Your Hair's on Fire! is a brilliant and inspiring road map for parents, teachers, and anyone who cares about the future success of our nation's children. I enjoyed reading the book, it was certainly well-written. It's amazing what one teacher has managed to accomplish with a group of kids who otherwise would have been relegated to the future "have-nots" of America. I would love to have such a great bunch of kids in my classroom - and I do have some really sweet, caring students. But then it got depressing. I started the year with 171 students. The idea of giving that much attention to each and every student is quite daunting. I suppose it must be easier in elementary school...but then, my husband teaches in an elementary school district and he has 40 kids in his classroom. Unfortunately, some of them have bigger problems than he can deal with in the classroom - students who are on probation for serious issues of violence, students who are already parents at age 12, etc. What was really depressing was looking at how much time he spends to get these results. 12 hours a day? 6 days a week? If I spent that much time on raising other peoples' kids, who would raise MY kids? I want to be a great teacher, and I do my best - but I also have a husband and three kids of my own who need some attention from time to time. I'm not going to give up on being a part of their lives so I can turn out excellent students - I'd like the parents of my students to help me along the way. Sadly, many of them don't. It's the teacher's problem if they aren't behaving, and it's the teacher's responsibility to fix the problem - but you can't actually do anything to fix the problem, because the parents will sue. Teach like your hair is on fire. When I saw the cover of this book, the thing that caught my attention wasn't the catchy title or the nice picture of a teacher with his students- it was the explicit phrase "an actual classroom teacher" written below the author's name. As a high school teacher myself, I am skeptical of people who are hyped up as a "Superteacher" who attempt to offer advice and motivate others when they themselves have left the profession after a brief stint. I found it inspiring to read the words of a teacher who has been in the profession for over 25 years who is still very excited about the day to day events in his classroom. Since I teach in Los Angeles, I decided to visit Rafe's classroom to see if he lived up to the high standard set in his book. As hard as it might be to believe, Rafe is as dedicated and as good as he sounds. His personality is consistent with the tone of the book's writing, and unlike some of the other book reviewers, I appreciated his candor and willingness to state his opinion on specific people and issues in education. Most people who achieve Rafe's level of acclaim are scared to give anything but the predictable or politically correct answer- but not Rafe. Rafe Esquith's latest book is aimed at teachers and parents, but the parent part is mostly lip service -- this is mainly a book for teachers. If you're interested in this "teacher of the year's" methods, this book may be worth a look. It is less so if you teach a particular subject, as the book is better suited to elementary teachers who are generalists and teach English, math, social studies, science, art, music, and gym (to name a few) because he devotes an entire chapter to each. High school and middle school teachers will find less of interest here. OK, so what is it you're looking for from a book like this? If you're more in it for Rafe's STORY and for what goes on his classroom, have a ball. If you're more in it for selfish reasons -- that is, methods you might emulate yourself in the classroom, proceed with care. There's no denying the book contains some useful advice and methods, but it also devotes much attention to matters beyond the realm and finances of most teachers -- full-play productions of Shakespeare, field trips that involve airplane flights (not buses) cross country, film festivals and book clubs held after school or at 6:30 in the morning. Clearly this is a devoted man and, by comparison, some teachers may feel depressed by all he pulls off (while still maintaining a life of his own). Highlights for me were the Six Levels (in which Rafe explains wrong reasons and right reasons that kids obey their teachers), the well-thought out attack on standardized testing (the bane of any school), and the overall iconoclastic tone. Also, a few of his ideas were illuminating. True, there were not a lot of practical ideas for the classroom, but there were some and some are bound to be of use for teacher/readers. If I taught elementary grades, I'd invest in this book and add it to my professional library (go ahead, set the bar high for yourself). If I taught junior or high school (or were simply a parent interested in education), I'd check it out at the library and pick the chapters that best suited my interests. In any case, the bottom line is this: we should all be grateful for teachers like Rafe Esquith. If you are the type of person who naturally thinks out of the box, if you are always looking either as a parent or a teacher, for new ideas of things for your kids to try, read this book. I borrowed it from the library and after reading it I bought 3 copies, 1 for me and 2 for a couple of my best friends! It's THAT inspiring and impactful!! The way Mr. Esquith gets past the 'rule by terror' attitude some parents and teachers use, to the 'get the kids to behave because they WANT to not because they HAVE to' attitude is so right on and common sensical sometimes we just need a little reminder and this book is it. Things he's teaching the kids will help them be better members of society not just smart people. The fact that they also get great test scores is icing on the cake! I picked this book up because I work with 4th-6th graders at an after school center. Regardless of if you are a teacher or not - if you work with children you MUST read this book. The tips, tricks, and ideas alone are priceless. I really admire that Rafe is a teacher and not just an educational theorist/researcher. He reminds us that even though our school systems are getting more and more bureaucratic, we can still (and we must, really) strive to teach our students. He fights against complacency and disillusionment with his honest portrayal of education. I really enjoyed reading this book. While not everyone can devote the amount of time to their job that Rafe can, everyone can take something from this book. Even if it's as simple as his philosophies--build a relationship of trust with your students and expect them to simply "be nice and work hard." If you really think about it, all rules really boil down to being nice and working hard. Every School Needs a Rafe! Haim Ginot once said that,..."the teacher is the decisive element." I must say that Rafe Esquith reflects the truth of that statement as well as any teacher that exists. I was thrilled from the beginning of his awesome book to the very end. Rafe Esquith is a fifth grade teacher in the now famous Hobart Elementary School in inner-city Los Angeles. His room (56) has become just as famous. The kinds of things he gets his students to accomplish are nothing short of incredible. They read difficult literary works, like To Kill a Mockingbird, and virtually everything by Shakespeare. They tour and perform his plays. They learn to play musical instruments. They become excellent math students, learning advanced algebra and problem solving. They are mannerable and polite. They know all kinds of interesting facts about virtually every subject under the sun. They give their time to charitable causes. And they are only fifth graders from impoverished backgrounds! Rafe's book has seventeen chapters and an epilogue. The book is well-written and highly readable. Rafe has a tendency to brag, sort of, but when you're that good and that confident, it sort of leaks out, so I don't hold it against him too much. Can he give himself more pats on the back? Yes, Rafe had some great ideas in his book. I am a 5th grade teacher as well, and I purchased the book to find some more ideas I could use with my own class. What prevented me from giving this book 5 stars is that Rafe takes so much credit for his students' successes. It is important to understand that there are many factors and issues that help a student succeed (and fail). Yes, teachers are inspirational. However, I found it very hard to believe that Rafe can take full credit for his students becoming doctors and scientists. Also, he makes so many blanket statements that with "method x" (or whatever he is describing in that chapter), his students "have learned". Let us not forget that each classroom has special needs students (I have 2 moderately autistic kids in my class along with 5 who are below their reading level), many of whom will not immediately learn these skills that Rafe is dishing out. There is also an implication that Rafe had "invented" many of these methods and strategies. Much of what he preaches are what is taught in teaching credentialing programs. Rick Morris is also a guru of excellent teaching strategies. Yet, Morris does not take 100% credit for those teachable moments that we teachers get. Like most people who read this book, I am a teacher, and I happen to work in the same school district as Mr. Esquith, the infamous Los Angeles Unified School District. Pretty much everything Mr. Esquith says about the district's dysfunction is, in my opinion, true. That aside, however, Mr. Esquith has written a book about how to be the sort of teacher that most sane people don't want to be. Mr. Esquith, by his own admission, spends twelve hours a day, six days a week, forty-eight weeks a year, with his students. The other four weeks he takes them on the road to places like Mount Rushmore, Washington, D.C., Yellowstone National Park, the Ashland Shakespeare Festival, and a number of other places. By my standards, Mr. Esquith "has a screw loose." He spends infinitely more waking time with his students than he does with his own family, and his students spend infinitely more of their waking time with him than they do with their parents. I have a problem with that - it seems completely inappropriate on any number of levels, and I wonder if in the long run it is really good for the students. I enjoy teaching (seventh-grade social studies), and do the best I can. However, when my work-day is done I go home to this thing called my life. If I kept Mr. Esquith's hours, my wife would, she told me, divorce me. My friends would never see me. I would never make new friends except in the context of my teaching. In other words, my life would be thrown completely out of balance, as is Mr. Esquith's. While new teachers will perhaps be inspired by Mr. Esquith's heroics, they should ask themselves if they plan on following Mr. Esquith's path. Veteran teachers like myself will probably not benefit much from this book. We'll be too busy wondering why on earth Mr. Esquith would want to spend so much of his time with other people's ten-year-olds. This is not sour grapes. What I do as a teacher would not work for Mr. Esquith. What Mr. Esquith does as a teacher would not work for the vast majority of those in the teaching profession. Perhaps, as The New York Times says, Rafe Esquith is a genius and a saint. All I know is that I prefer my life to the one he represents as his. Rafe is an amazing individual. This book is a road map to how teaching should be. Some of it can be downright unbelieveable, but after seeing his kids in action, I can assure you he practices what he preaches. This book really deserves 4.5 stars, but there isn't an option for that, so I rounded down to 4. Esquith is undoubtedly a gifted educator, and does a very good job with the writing in the book. I'd highly recommend it to anyone involved with kids in any capacity. Rafe's experiences, frequently humorous stories, and amazing accomplishments will definitely encourage and motivate the reader to do more, to go further in the pursuit of Room 56-level education. I found the description of the 6 levels of motivation (taken from "To Kill a Mockingbird", if I recall correctly) the most germane to my life, and the most helpful no matter what the reader's situation. Pay special attention to that chapter. Other highlights include Esquith's techniques for teaching math, and his focus on teaching his student's basic finance and money skills. Since virtually no schools (and few parents) in America teach students any practical money-management skills, that second point in particular could be put into practice by any elementary or middle-school teacher successfully. The only negative about this book is that it may mislead a young teacher into thinking they can accomplish what Esquith has without the kinds of resources he currently has had access to. It's easy to jump right past the parts of the book where Esquith reports how difficult it was to add things to his classroom early on, and to think that anyone can purchase full studio music setups or professional-quality intruments. To his credit, Esquith quite intentionally dissuades the reader from this idea, but I don't think he goes far enough. I am a teacher of 23 years. I have raised two children who are excellent students and learners. I think about education every single day. I spend hours designing lessons. I think about my students constantly, especially those who are challenged by dysfunctional families, poverty, language barriers or learning disabilities. I keep in touch with generations of kids I have taught since I live in the town where I teach. I am aware of both my successes and my failures. I am a fan of Parker J. Palmer's "The Courage to Teach" and just finished two books on seminar teaching by Brooke Workman, whose dedication, practical approach and humility were apparent on every page. With all of this in mind, I give Esquith's book one star. There is something amiss here. Amid a few good ideas is a lot of HIM. Snarky unnecessary comments about his fellow teachers, about his administrators, about parents who may disagree with him; a ridiculous expectation of spending 12 hours a day at school; a busy-ness in the classroom that I find manic; self-serving references to his celebrity friends, and a sense of humor that isn't . .. funny. The book is not even that well written for someone who professes to love words and literature. Those phony dialogues between "Rafe" and his kids are nauseating! Where are his editors? As a public school teacher, I often lament about all the frustrating and pointless changes that I have had to endure over the course of my 23 years of teaching. The madness of chasing after accountability has slowly been sapping the energy out of myself and I am sure out countless others in the teaching profession. Just when I was thinking all hope was lost I stumbled upon this incredible book by Rafe Esquith. In the tradition of Chicken Soup for The Teacher's Soul, this book truly does remind us about what motivated us to become teachers in the first place: Our Students. The true beauty of this book is that it is written by someone who is actually in the trenches. Mr. Esquith has been teaching in the same school for 22 years in a less than desirable location in Los Angeles. This clearly adds to the credibility of his message and the inspirational affect the book has on the reader. In short Rafe Esquith "gets it". He shares in the book his own frustration with a "test happy" system that has gone mad, and how it drives him crazy. Yet despite this reality, he has still one sanctuary left that he has control over and that is Room 56 at Hobart Elementary School. The book is a beautiful blend of practical suggestions and inspirational proof of what takes place in room 56. As a teacher at the high school level I was skeptical about how I could incorporate any strategy that he used in a 5th grade classroom with juniors and seniors. What I learned however, is the message he tries to convey to his students, "be nice and work hard" though simple, has relevance for any age level. This book is a must for all teachers. Whether you are a wet behind the ears newbie or a slightly graying grissly veteran like myself, this book will inspire you. The book is also great for anyone who needs to believe that there are still inspirational people in the world. I know this is going to be a book that I keep very handy as a reminder to me about why I do what I do. Thank God for incredible human beings like Rafe Esquith. I know he did not write this book for recognition or praise because he is clearly a level VI thinker, but I am thankful he did. This book can and should inspire generations of current and future teachers for years to come. As a first year 5th grade teacher this books was inspiring. There are definitely some great ideas that I will try. Yet, after reading the book and reading some of the negative reviews I couldn't help but agree that Esquith does tend to criticize his fellow administrators and peers which goes against the six levels of moral conduct he cites. What Esquith does seems almost superhuman and although his stories were quite endearing I really had a hard time connecting with him as a fellow teacher. It felt almost like he was gloating about his successes with his students but would downplay his own doing by adding a hint of modesty. The book is really more about his story which is great if that was his intended purpose. But for myself, I personally have enjoyed the books that speak for all teachers. Earlier this month, my sister gave me a book for my birthday, which is hardly a rare event, as I'm an avid reader. Furthermore, it was a book about teaching - again, not much of a surprise. Now, I must confess that books about teaching rarely thrill me. They are often filled with self-aggrandizement about how wonderful the author is. But I wanted to tell you that this book because it really got me juiced up. 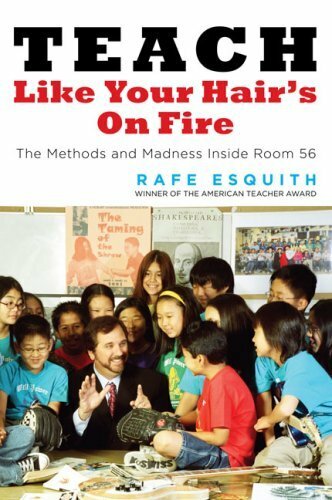 It's Teach Like Your Hair's on Fire: The Methods and Madness Inside Room 56 by Rafe Esquith and I highly recommend that you read it; hit Borders this week and read it over break. I couldn't put it down and plan to re-read it. I just kept thinking, "This is the kind of teacher I want to be." You may have heard of Rafe Esquith's new book, Teach Like Your Hair's on Fire. Read it. If you are a teacher, read it. If you are a parent, read it. If you have absolutely nothing to do with kids, read it. It's not that you will agree with absolutely everything he says. You may even come away feeling pretty inadequate in the face of all that Esquith accomplishes in his classroom. I know I did. Still, you are sure to come away with some great ideas. Some of them may even transform how you think about kids and schools and education. "Schools have lost sight of why we read....I have never seen district reading objectives in which the words joy, passion, or excitement top the list. I think they should." Or: "I always remind my students that life's most important questions are never asked on standardized tests. No one asks them questions regarding character, honesty, morality, or generosity of spirit. In room 56 these are the issues of true importance." I love how he teaches kids to spot, and sidestep, potential traps in tests. I love how he teaches real-world skills of organization, delayed gratification, and money management. But, most of all, I love how he has come to make the foundation of his classroom Lawrence Kohlberg's Six Levels of Moral Development. I was surprised at that. However, by the end of the book, I was a believer. My thoughts keep returning to his approach, and I think it is a sound one. He gives kids tools for succeeding in life, but his most important gift is that he helps them become decent, responsible, moral human beings. Read the book. He explains it so much better than I can. If you are a public school teacher then you engage in state-sponsored brainwashing and should be sent to prison! "Free education for all children in government schools". -Karl Marx, 10th plank of communism. Marx is back, this time he's wearing Dockers. In order to bring about rule by the proletariat, Marx said there were some obstacles in the way that needed to be abolished: Family, Religion, and Culture. Our public schools are doing everything they can to do just that! Family: We - are - family, Trotsky, Lenin, Pol Pot and me! From the tender age of 5 straight on to 18, liberal teachers have a death-grip on your children's psyche from 8:00 until 3:00! The Dems are already discussing legislation to create government daycare systems that could have your kids in their clutches straight out of the womb! Then they have these parent-teacher conferences that are frighteningly similar to $cientology confessionals, only they are not forced to talk into a pair of tin-cans! The teacher's grill them on a long list of subjects until the parent is so tired and wanting to leave that he/she will give into any/all of the teacher's demands! Religion: Mommy, why can't Johnny read (the Bible?) As long as man holds himself accountable to God and not man, the State can never truly own him! Take away God and man's highest authority will be the State! Yike stripes! The trial that began the menagerie was the infamous Everson v. Board of Education 330 U.S. 1. (1947). Which not only took prayer out of schools, but gone on to remove any mention of God! Culture: Hey, I've got the diversity pneumonia and the multi-culti flu! By smothering your child with every culture but his own, the State is in fact taking away his culture. By the time your child leaves school, he is so bewildered by this cultural bombardment that he may start chanting is Swahili! This small example taken from edchange.org, will allow you to hear it from the horse's mouth! "Content must be complete and accurate, acknowledging the contributions and perspectives of ALL groups. *	Ensure that the content is as complete and accurate as possible. o	"Christopher Columbus discovered America" is neither complete nor accurate. *	Avoid tokenism--weave content about under-represented groups (People of Color, Women, Lesbian, Gxy, and Bisexual People, People with Disabilities, etc.) seamlessly with that about traditionally over-represented groups. o	Do you present under-represented groups as "the other"? o	Do you address these groups only through special units and lesson plans ("African American Scientists"; "Poetry by Women") or within the context of the larger curriculum? o	Do you "celebrate" difference or study, explore, and acknowledge it as part of the overall curriculum? *	Study the history of discrimination in curriculum and ensure that you are not replicating it. o	Are supporting stereotypes (learning about Native Americans by making headdresses and tomahawks) or challenging them (learning about Native Americans through resources by Native Americans)? o	Are you supporting or challenging the assumption that our society is inherently Eurocentric, male-centric, Christian-centric, heterosexual-centric, and upper-middle-class centric?" Well, having exposed without question our Marxist public school system, let's take a look at its list of crimes! *	Teachers should, in theory, present numerous sides of issues and give their pupils a well rounded education. Then why is it that they are all FORCED to become members of the NEA, a far-left lobbyist group!? The union even tells its members who to vote for! This sounds like racketeering to me. Let's use those RICO statutes! *	In order to keep as many people as possible within their grasp, the NEA refuses to give vouchers to minorities so they can escape to the freedom of private schools! *	Whenever a student shows any sign of individualism, unconventional behavior, or beliefs that are not endorsed by the State, they are prescribed mind control drugs such as Ritalin and Prozac! *	The public school system puts so much stress on our children that they are beginning to lash out and shoot, bomb, and otherwise kill their fellow classmates! *	Some teachers even engage in s-e-x acts with their students! In fact these cases are in the news all the time! *	Check out this definition of prison and be mortified: "A public building used for the confinement of people convicted of serious crimes." That's what public schools are! Public buildings used for the confinement of people! But public schools are even worse because the children haven't even committed any crimes! Or maybe our government just assumes they will and this is a form of preemptive correction! Is the government proselytizing them to have a herd-like mentality. *	This just in! Youth suicide rates up! Children would rather die than go to public school! In 1998, among youth ages 10 to 19 in the United States, there were 2,054 suicides! Those kids could have grown up to be doctors or great scientists but the public school system drove them to kill themselves! Your eyes are probably blinded by tears brought on by the long list of grievances I just listed. Therefore, I will give you a moment to wipe them from your eyes and regain your composure. All done? Good, because there's hope. Home schools- Parents, you don't need the government to do your job for you! You are more than capable of teaching your children everything they need to know, even more so as you can give your child 100% of your attention! Make sure you always have your child take part in activities with people their age, such as Church, sports, and home-schooling events so they are prepared for the world when they have graduated. Fathers, take your son to work and let him observe, when he gets a little older, begin some hands-on training. Mothers, don't just cook and clean for your daughters, have them cook and clean with you to provide hands on training. The opportunities for preparing your child for the rat-race, without government intervention, are limited only by your imagination and lack of initiative! The best part is, unlike school where they sit down all day and are filled with energy when they get home, your tikes will be tuckered out by the end of your hands on instruction, leaving you and your spouse ample free-time to get to work on making more independent thinkers! In the year I started second grade, Rafe Esquith started teaching. Teach Like Your Hair's On Fire contains what he has learned about teaching and why being a teacher is his calling in life. He divides the book into three parts: There's No Place Like Home, The Method, and finally, The Madness. The first part describes how to earn the trust of students and help them think beyond themselves. Chapter Two, "Searching for Level VI" is especially interesting and useful for anyone who either works with or lives with children. Part Two, The Method, takes up the bulk of the book. Here he covers the fundamentals of a good education: reading, writing, mathematics, studying for tests, geography, science, art, sports and economics. By the time you finish chapter 11 you may feel overwhelmed by all the things Rafe manages to accomplish with his students but you will also feel exhilarated by his boundless enthusiasm. Part Three, The Madness, closes out the book with all the extra curricular things he does with his students. These include the Hobart Shakespeareans, the annual trip to Washington D. C., and the Feed of the World project. I really appreciated Esquith's take on the Six Levels, which he borrows from a literary critic who used it to analyze the characters in To Kill A Mockingbird. This philosophy, along with his two essential rules (Be kind. Work hard.) reflects a wonderful perspective that other teachers would do well to emulate. However, as other commentators have mentioned, twelve hours, six days a week is not practical, or even possible, for many of us. I envy Esquith that he works in a school where his iconoclastic approach is tolerated. Two weeks ago I my principal called me on the carpet for giving free guitar lessons to two of my interested students one day a week during recess. Many teachers are afraid to do anything innovative or outside the curriculum. It seems that anything can be viewed with suspicion. And what about the weekly "film class," in which children are left unsupervised in a classroom to watch a movie while Esquith and other teachers attend a faculty meeting. Here in Colorado that's illegal! This is a book for readers who loved Rafe's previous book ("There Are No Shortcuts") and for those who complained that it didn't have enough "how to" in it to allow other people to try his methods. In an interview, Rafe described this book as containing two levels of guidance: information that can be used by any teacher, and "second level" activities that are appropriate for teachers who are as "crazy as [he is]". It's also a book for parents who believe that public schools can't succeed; Rafe shows that this isn't so. Some people see Rafe's books as self promotion. I disagree. He goes out of his way to make clear that successes are by his students, not himself. If he were out to promote himself, he would have left the classroom and taken the many opportunities he's had to become a teacher of teachers, a lecturer, or an administrator. Instead, he's chosen to stay in his classroom; his books are to satisfy the requests he receives for sharing the secrets of Room 56. It's on my Wanted list for sure! I'll be honest, I haven't bought this book yet. As a Senior in College with loans and student teaching looming in the distance I just don't have the time to go buy this book and sit down and read it with the attention it deserves. But I want it so badly that it will be topping out my Christmas list before any of the new techno gadgets. "Teach Like Your Hair's On Fire" is a far cry from his earlier self-serving book, "There Are No Shortcuts". This time, Mr Esquith writes with a comfortable humility and spends less time dishing out former student letters and comments. "TLYHF" is neatly divided up into sections (although numbered chapters and a table of contents would have really helped) and focuses on subjects individually. Within these sections, Mr Esquith details how he and his students go about accomplishing set tasks; he provides at length different ideas and tactics he uses in order to get students form point A to point B. I really enjoyed his classroom management techniques, such as the "six stages of morality" which I used with my classes with great success. The downsides: he continues to speak of himself as a lone island trying to stand against a disparaging sea of public education and educators. He even went so far as to take an angry note written by a colleague, photo copy it, pass it out to students, and have them edit it for grammar and spelling mistakes. Honestly, how unprofessional is that? Especially for a teacher? What message are you sending your students here? Secondly, I am overwhelmed by the amount of time he puts into his classroom. As teachers we already spend a good deal of time outside the classroom just preparing for what goes on inside...isn't it healthier to actually find a balance? Personally, I think it's an incredibly unhealthy borderline obsession. Teachers need to maintain their own lives and certainly the relationship with their families. Whilst he claims that his wife supports him wholeheartedly, what about his poor children? Thirdly, there are boundaries that I find crossed too many times with students. Trips should be chaperoned by more than just the classroom teacher, students should be showing respect by referring to you by your last name not your firs, and parents should be the ones showing their young ones around to colleges. It feels that he is trying to hard to be a father to each student...what about being a father to his children and letting other parents parent their own?